Here’s Canon newest DSLR, the Canon 1DX. Lots of hoot about it not having 1080 60fps, like the Sony A77, but it is still a monster of a camera. One cool thing is it doesn’t have any moire, and it is a full frame like the Canon 5D. TOKYO, October 18, 2011—Canon Inc. and Canon Marketing Japan Inc. today announced the introduction in Japan of the new EOS-1D X digital single-lens reflex (SLR) camera offering a high level of performance to satisfy the demands of professionals in such fields as sports photography, photojournalism and studio photography. To date, Canon has developed its top-of-the-line digital SLR cameras through the 1Ds series, which delivers exceptionally high image quality, and the 1D series, which achieves superlative high-speed performance. Integrating the strengths of these two series, Canon’s new professional flagship model, the EOS-1D X, brings together the highest levels of image quality and speed performance. The new Canon EOS-1D X incorporates a newly developed approximately 18.1-megapixel 35 mm full-frame CMOS sensor which, in addition to achieving an optimal sensor size and pixel count balance, effectively makes use of Canon’s proprietary semiconductor technologies to ensure low-noise performance. Featuring Dual DIGIC 5+, which comprises two new high-performance DIGIC 5+ image processors—each realizing approximately 17 times the processing power of DIGIC 4—the camera delivers exemplary image quality and speed performance, in addition to data processing power that has been greatly enhanced compared with the EOS-1D Mark IV, released in December 2009. Compared with the EOS-1D Mark IV’s sensitivity range of ISO100–12800, the EOS-1D X offers a range that has been expanded by two steps, to 100–51200,* for outstanding imaging results with reduced noise, even when shooting indoors and other dimly lit settings. Combining a 100,000-pixel RGB metering sensor and DIGIC 4 processor, the Canon EOS-1D X’s new AE system, the EOS iSA (Intelligent Subject Analysis) System, is capable of determining not only brightness levels, but also a subject’s face and target color, making possible high-precision exposure control. The newly developed AF system incorporates an AF sensor with a total of 61 autofocus points for improved high-precision subject capture. The sensor includes 21 f/5.6 cross-type sensors, 20 f/4.0 cross-type sensors, and 5 f/2.8 dual cross-type sensors. Equipped with 20 f/4.0 AF points, the new camera offers the same level of precision as the EOS-1D Mark IV at f/2.8. Additionally, working in tandem with the new AE system, the camera’s EOS iTR AF (Intelligent Tracking and Recognition Auto Focus) function is capable of tracking a subject’s face or target color to maintain focus on a moving subject. The Canon EOS-1D X’s new Dual DIGIC 5+ image processors make possible high-speed continuous shooting of up to approximately 12 frames per second with high-precision AE and AF performance. In the ultra-fast continuous shooting mode, the camera realizes a continuous shooting speed of up to approximately 14 frames per second (mirror remains raised during shooting, JPEG images only). 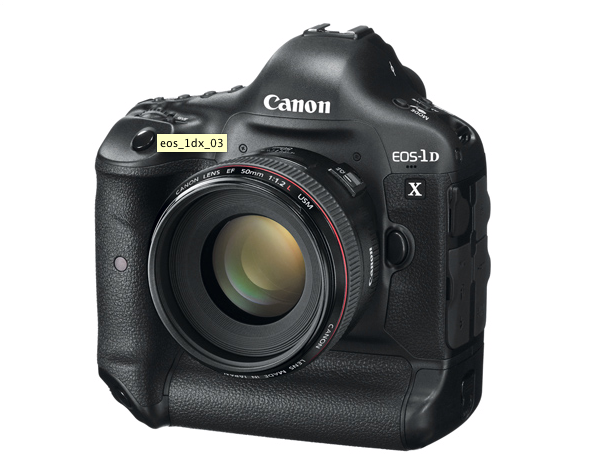 The Canon EOS-1D X delivers high reliability even in harsh shooting conditions. The rugged shutter unit boasts a lifespan of over 400,000 cycles while the camera’s exterior covers and operation panels employ a dust- and moisture-resistant design. Furthermore, the camera features a new dust-removing system incorporating two vibrating elements, a first for the EOS series, improving on the earlier cleaning system. The new EOS-1D X comes equipped with a Gigabit-Ethernet connection that, when shooting in locations equipped with a wired LAN connection such as large sporting arenas, enables data to be transferred to editing desks quickly and reliably. Inheriting the same basic operating design as previous models, which focused on offering instantaneous operation, such aspects of the new camera as its button and control layout and GUI were reviewed and redesigned, with great attention given to operability when held vertically, during blind-touch operation, and when confirming images. Featuring advanced video-capture capabilities, the Canon EOS-1D X’s upgraded imaging system and Dual DIGIC 5+ deliver greatly enhanced movie quality. In particular, the camera minimizes the occurrence of color artifacts and moiré, and enables the shooting of low-noise video even in dark conditions.